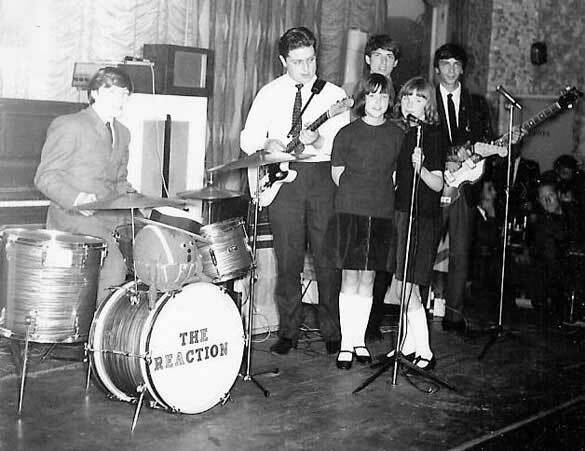 The Reaction at the Steelworks Club in Hartlepool with Jimmy Fawcett on drums, Kenny Allen on guitar, Margaret Burgen, Neil Thubron, George Hart, Moira Forcer, Olive Hart and Barry McGurk. 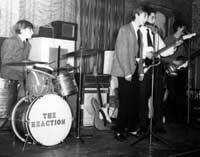 This early photograph of Reaction was sent to us by Barry McGurk. 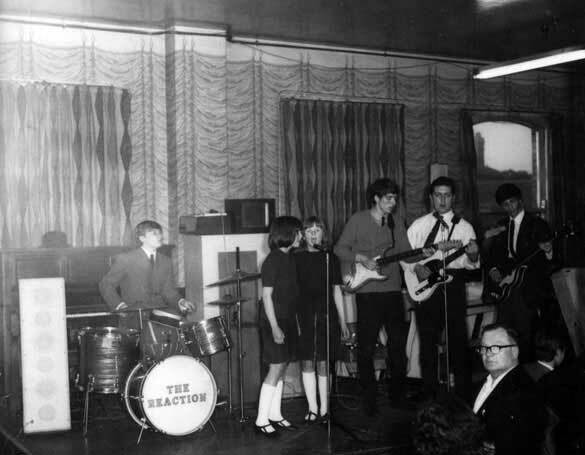 He thinks it was their first gig at the Steelworks Club in Hartlepool about 1965. 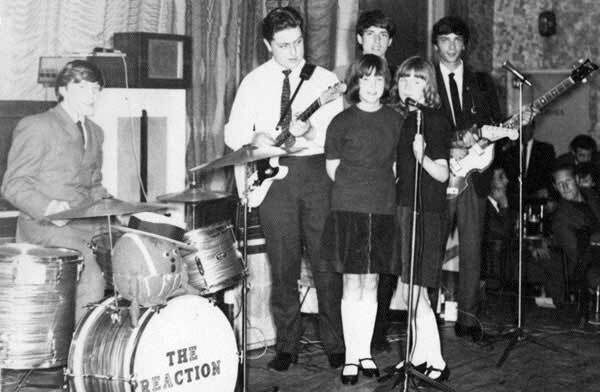 It shows Jimmy Fawcett on drums, Kenny Allen on white Fender Telecaster, George Hart is at the back with Barry McGurk on the Hofner violin bass and the young ladies at the front are Margaret Burgen and Moira Forcer. 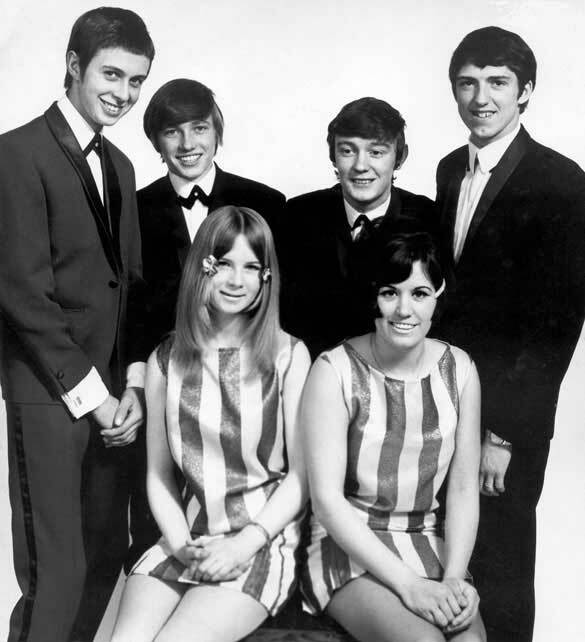 Jimmy Fawcett, Margaret Burgen, Moira Forcer, George Hart, Kenny Allen and Barry McGurk. 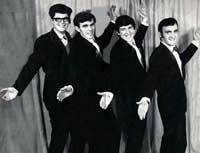 Jimmy Fawcett, Neil Thubron, Kenny Allen, Barry McGurk and George Hart. 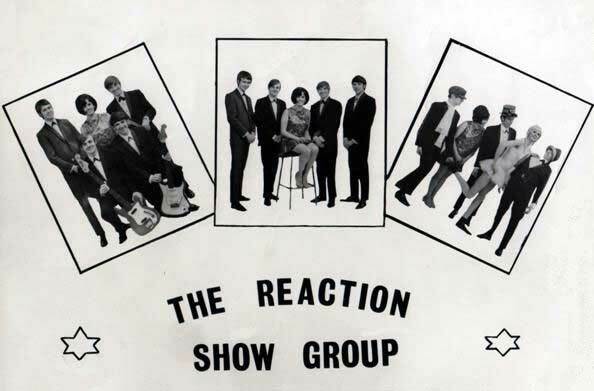 Another from the archives dating back to about 1968 - the Reaction Showgroup with George Hart, Neil Thubron, Jimmy Fawcett and Eddie Saul. Olive Hart (now Olive Bage) who sent us this photograph, is standing in Neil's hand. 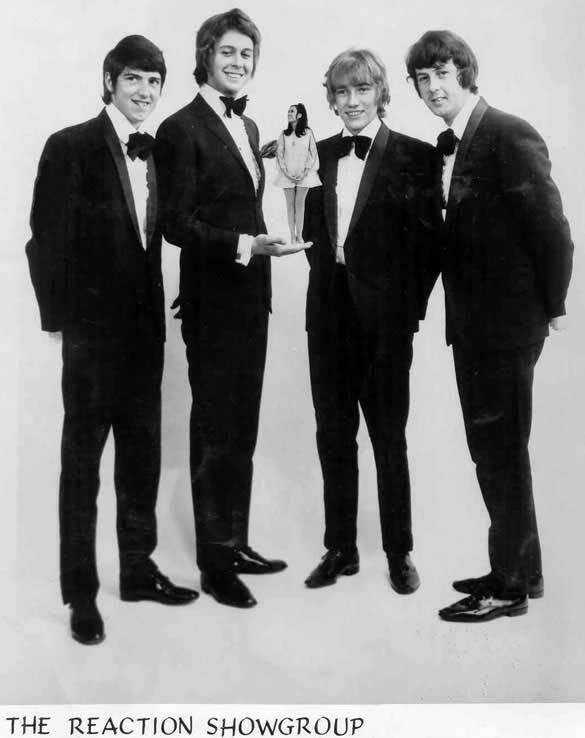 The photograph without Olive standing in Neil's hand - with Neil, George, Jimmy and Ed. 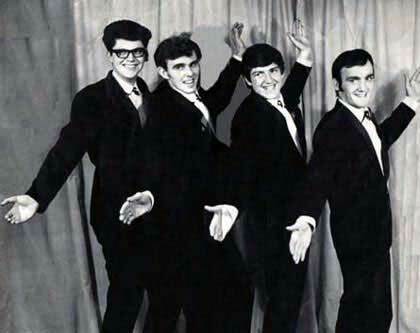 The Reaction Show Group this time inlude, from left to right, Neil Thubron, Jimmy Fawcett, Bob Mordy and George Hart. The two girls are Moira Forcer and Olive Hart. 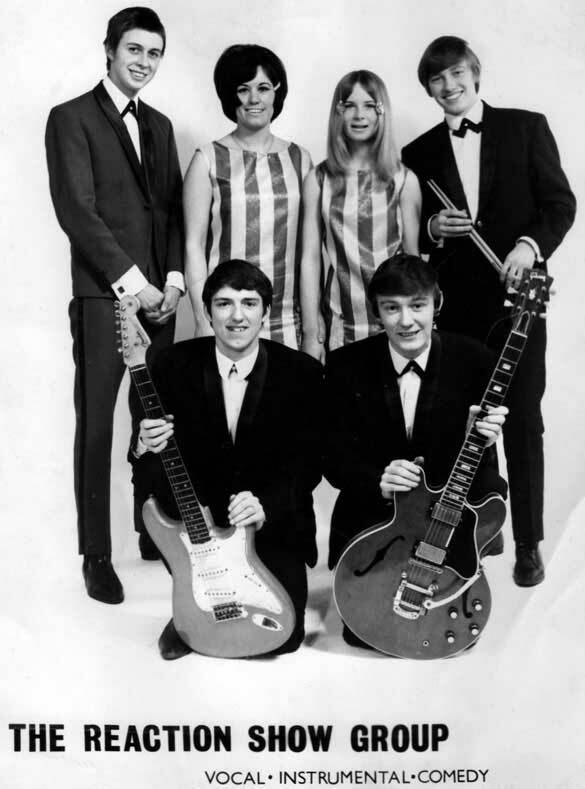 Another publicity image of The Reaction Show Goup with Neil, Olive, Moira and Jimmy on the top row with George and Bob kneeling with guitars in hand. Not the best of quality but worth including anyway. 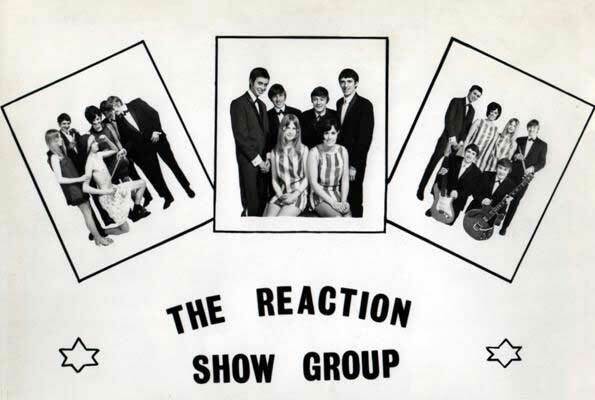 The Reaction from sometime in the 60s with Eric Brazill and Jimmy Fawcett at the top with Neil Thubron, Olive Hart and George Hart seated. This page is dedicated to the memory of Kenny Allen, Eric Brazill, Jimmy Fawcett, George Hart and Kevin Irish. 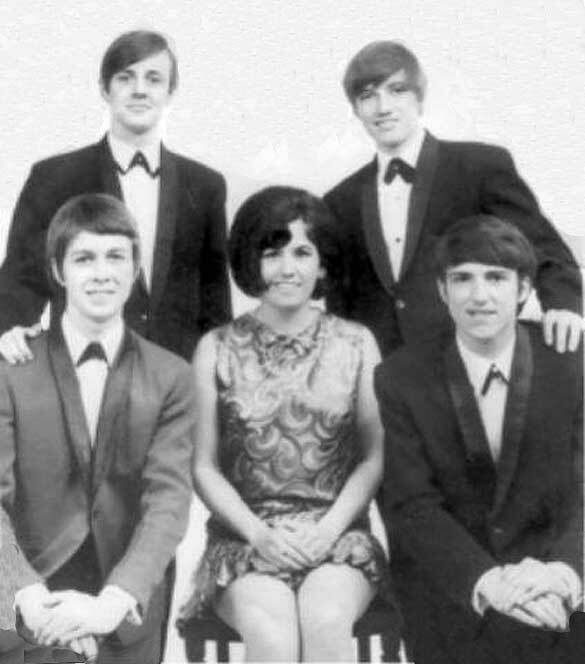 Some publicity material when the band were under the sole representation of the Northern Star Agency, in Gateshead. Click on the small photographs to see them larger and in greater detail. 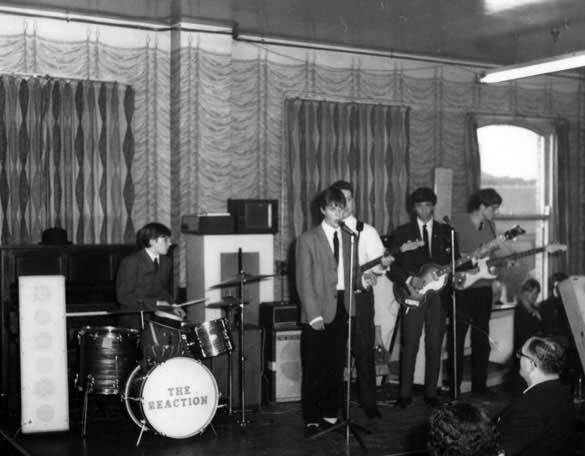 Kevin Irish, Alan Lindridge, George Hart and Kenny Leighton as the Reaction Road Show about 1966. 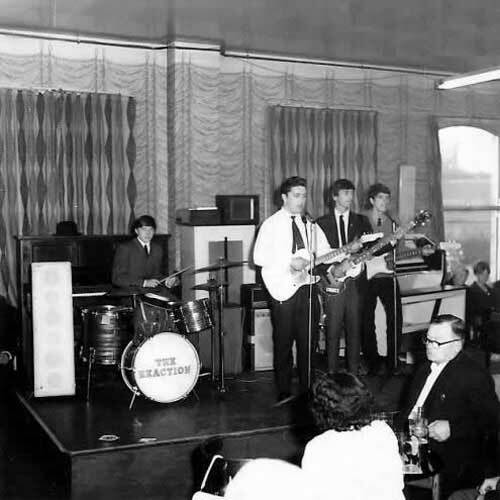 Jimmy, Neil, Kenny and George at the Steelworks Club in Hartlepool, about 1965, playing "A Whiter Shade Of Pale." More music at the Steelworks Club with Jimmy, Kenny, Barry and George. 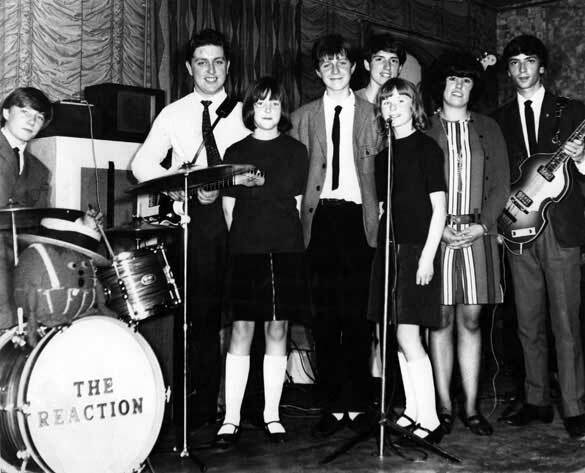 More 'Reaction' at the Steelworks Club in West Hartlepool with Jimmy, Kenny, Margaret, George, Moira and Barry. 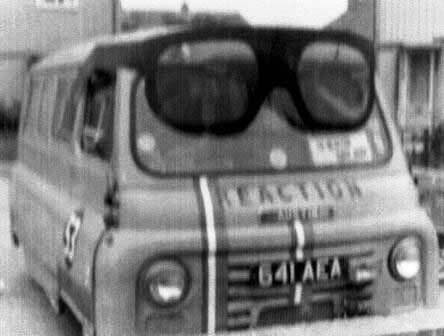 The old band van takes on the shape of the Beetle "Herbie" number 53 with some rather large sun glasses! 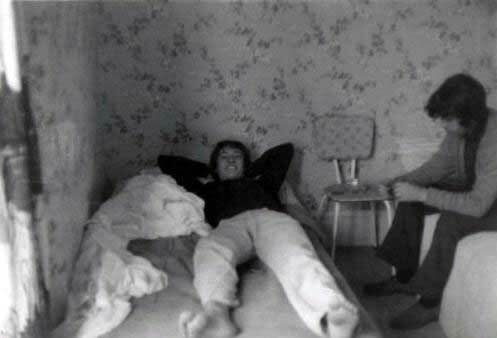 Jimmy Fawcett and Ed Saul in London digs. 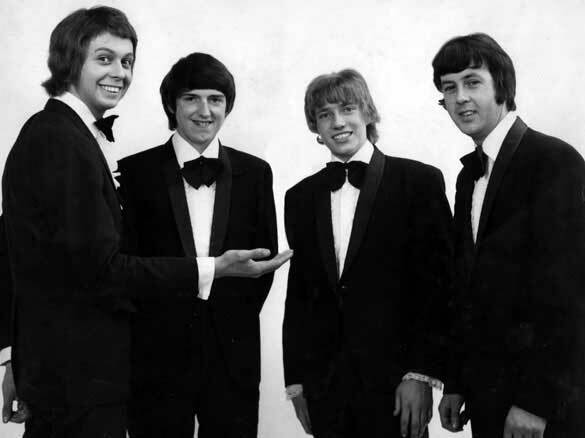 Jimmy tells the story about the time they were in London, about 1968, when their, usually reliable, van broke down. George and Olive headed back north and left Jimmy, Ed and Neil to look after the van with all the gear in the back. 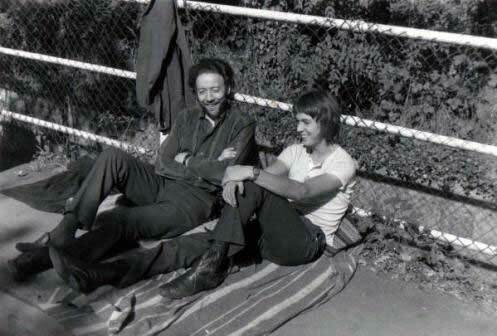 A kind taxi driver with Neil. The taxi driver was like a fairy Godfather to Jimmy, Ed and Neil. He paid for their food and drink until the van was fixed. 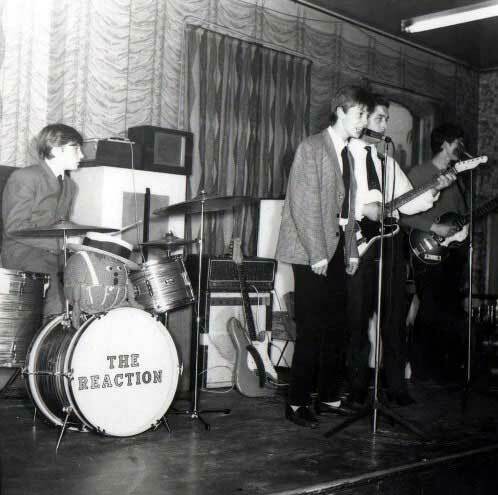 Eric Brazill played in Reaction, and other bands around the town, in the 60’s. 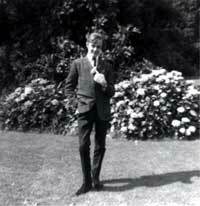 Eric sadly passed away back in October 1994. 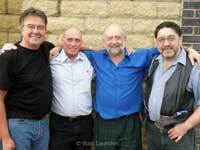 Some former band members of Reaction meet again to recall those happy days of the sixties. Neil Thubron, Jimmy Fawcett, Barry McGurk and Kenny Allen enjoyed a reunion in the Café Rappor Bar, in Hartlepool Marina, on August 12th, 2008. 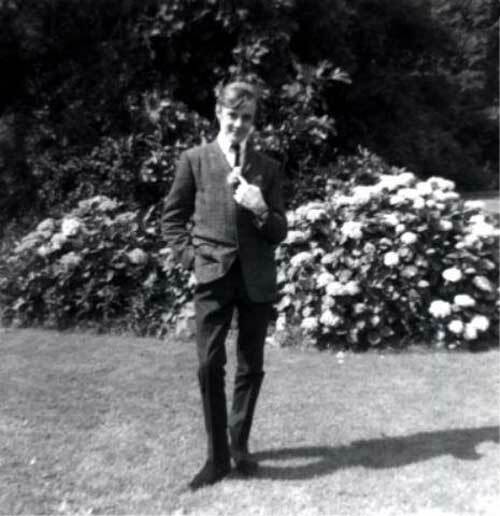 At the time this reunion photograph was taken Barry divided his time between England and South Africa but spent a few days in Hartlepool to renew old friendships. He still travels to South Africa but has since moved his English home to County Durham. Photograph © Stan Laundon. Thanks to Olive Bage, Jimmy Fawcett, Alan Lindridge, Barry McGurk and Derrick Rowbotham for their photographic contributions to this page.